Thoughts From An Expat Mom: I'm Baaaaa-aaaaaaack! OK, well, I will be the first to admit that it has been too long. Way, way, way, way, WAY too long since I have decided to bore/annoy/delight/entertain anyone with my musings. But- BUT- there is a very good explanation for it- we moved countries! I don't know if you've ever moved countries before with a cat and two kids, but it is pretty much the equivalent of a black hole and vortex meeting, entwining, and then sucking every last second of free time and ounce of energy that might possibly exist in your newly chaotic world. Now, that may not sound too pleasant to you, but believe me, it wasn't really so bad. How can that be? How can that possibly be? Because we moved to Singapore! Anyway, I believe that I have made my feeling about Singapore known in the past, but now we live here, so life is closer to ideal than it has been in a while. I WILL miss you, Jakarta, sort of. But let's get back to the art of moving, shall we? 1.) Contact several shipping companies. 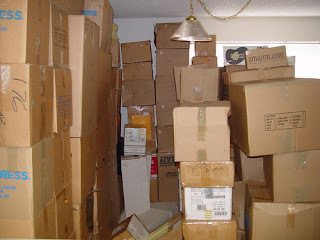 Have them come over to our house and look at everything that we MIGHT have wanted to take with us, then tell us that it would take a million boxes to fit it all and send us an insane estimate that was more than the cost of my first new car. 2.) Realize that at least half of our stuff won't fit into the size of condo that we will likely live in in Singapore, so decide which stuff stays and which goes. Involve children in this. Put things into "Give away" boxes, only to have crying children go back an hour later to retrieve them, because apparently they just CANNOT live without the talking frog that has sat, ignored, in a basket for the past two years. 3.) Sell, deliver and coordinate pick-ups of the half of the stuff that you did manage to give away. 4.) Contact pet relocators about 10-year-old cat who has moved countries with us three times so far. Receive estimate that cat will cost more than four rooms full of furniture to move, AND will be required to stay in quarantine in Singapore for a month. 5.) Secretly curse cat for being such a tolerant pet and putting up with the near-constant abuse of children and toddlers in the house over the years. Such abuse includes- but is not limited to- being picked up and carried around, being laid upon, being kissed in the face far too long and far too many times, being woken at all times of sleep because some tiny human has decided that it was Snuggle Time, and having dry food mixed in the water dish because some unsteady child has decided that feeding the cat is HER job. 6.) Secretly curse the 2-year-old for loving the damn cat so much. Sigh and add astronomical price of shipping cat 90 minutes away to the already-way-too-huge Moving Budget. 7.) Take said cat to several vet appointments for shots and blood tests. Then have cat shippers tell you that the information which they provided you was, in fact, completely WRONG and that your cat will have to remain in Jakarta for 6 MONTHS before she is able to relocate to Singapore. 8.) Scramble to find friend who is willing to host and care for cat for an astoundingly inconvenient amount of time. Find one and be forever in their debt. 9.) Deal with the bureaucracy involved in leaving Jakarta. This is equivalent to banging your head against the wall for days at a time, until you wish you would just pass out already and be done with the misery. 10.) Have to fire nanny during the last week of school and therefore deal with 2-year-old at home during the two full days that the shippers spent packing and moving out all contents of the house. I don't know if you have ever sat on the floor in the corner of an empty room while simultaneously attempting to entertain a 2-year-old and answer questions from packers who don't speak English about what goes and what stays, but it just might push you over the edge. Like I said, these are just a small sample of what was involved in packing up and leaving Jakarta. And then my head exploded. No, not really. Well, maybe. Or at least it sure as hell felt like it. However, survive it we did, and THEN began the next chapter of the summer: Settling in. Settling in can be fun, but it can also involve 10,000 trips to Ikea and a constant re-evaluation of the budget because those 200 things that you didn't really know that you needed? Well, you need them. And you need them NOW. It also involved living out of duffle bags for a few weeks, which might not seem like a big deal to normal people, but to people with small kids, it is like camping in the middle of Alaska with a pair of socks and a can of soup. In winter. All that careful planning and packing that I'd done? Well, let's just say that if I HAD the energy to laugh, I would. The good news was that, since we were moving to Singapore, we could go out and buy whatever the kids were lacking, but that takes us back to the previous paragraph regarding the budget. In addition, settling in was a time of exploring our new environment and appreciating its newness. Water from the tap! Sleeping all night without being woken by mosquitoes even ONCE! City buses! Public Libraries (AKA Free Books!)! Traffic rules...that are followed! Children's Theater! Wine in every grocery store -that one was pretty much just for me, but still! It's all here, and we all just drank it in. However, we did miss many things about Jakarta: our school, our friends, our colleagues, so it wasn't ALL sunshine and roses. There were a few sighs, and some "When are we going home?" questions to deal with, but eventually we moved into our new condo and everyone adjusted. So, there you go. The past 6 months in a nutshell. I didn't even go into the starting a new job and new schools, the action-packed visit from my parents, the week that I spent in Single Momdom while Jabiz went on a work trip to Ireland (I KNOW! ), OR the fact that I was laptop-less during the summer and relied solely on my iPad, which is great, but on which I cannot type more than a few sentences without people suspecting that a drunk monkey somehow got hold of it and knocked out an incoherent paragraph. BUT, things are sorted now, life is calming down in some ways, though also frantically picking up in others, and we are getting into a good rhythm. I already have dozens of blog posts in my head, but needed to get this one out before any of the others can manifest themselves. Life in Singapore is a wild ride! Glad you are loving it there. The girls are stunning. I can't believe how big they are looking since I saw them! Thanks, ladies! It is good to have the time to blog again, because as much as I love Singapore, there is PLENTY of blog fodder to be had here!